In this project, let’s build a simple Remote controlled switch for appliance controlling. If you know basic concepts of electronics, this circuit is pretty easy to build and test. The core of this circuit are two IC’s – which are infra red sensor IC’s – TSOP 1738. A couple of transistors and associated components complete the circuit – which is affordable for any hobbyist/student. Here is a versatile remote controlledÂ switch that can ON or OFF any appliance connected to it using a TV remote. goes low and pin 2 goes high. The high output at pin 2 is amplified to drive the relay. For the next signal the outputs of IC2 toggles state.Â Result, we get a relay toggling on each press on the remote. Any appliance connected to this circuit can be switched ON or OFF. Remote Controlled Switch Circuit Diagram with Parts List . * Before wiring the circuit make sure that the carrier frequency of the TV remote you have is 38 kHz.For that wire the sensor part only ,point your remote to the TSOP1738 and press any switch.If out put of TSOP1738 goes low then OK, your remote is of 38Khz type.Nothing to worry almost all TV remote are of this type. * You can use any switchÂ of the remote because for any switch the code only changes, the carrier frequency remains same.We need this carrier frequency only. * Assemble the circuit on a good quality PCB or common board. * The appliance can be connected through NO or NC and C contacts of the relay . * Use a regulated 6V power supply for the circuit. i have tried your circuit remote appliance switch and it works great but had left a problem that if i switch any other light or cfl it gets “turned on” if it is in off position and vice versa. so sir please send me any way to get rid of it,and i will wait for ur reply. sir, How to make this circuit 4 channel or more because there is CD4017 and CD4017 is many out put…? sir i want to simulate this circuit n try on bread n pcb too…..plz help me for the same…. Check the connections of IC3. Check Q1 emitter voltage without input it should be almost supply voltage. with remote shining on IC3 Q1 emitter voltage should fall. If this is not happening check IC pins for proper wiring. Without remote control short collector and emitter of Q1 for a moment and check whether the LED D2 is changing from on to off. By giving pulses by shorting and leaving Q1 collector and emitter, should toggle D2 from on and off. If not check IC1 and IC2 wiring and for proper pin connections. Can the remote controller also be used to turn a geyser on and off? I made that circuit completely and test work as a switch with tv remote control but when tube light switch On/Off at that time switch self operate . PLZ any solution this problem? hello sir.How can i turn on fan using remote control . pls give me a simple circuit . I am assemble on general purposes PCB bit it automatically toggle On and off after some time Please give me solution. 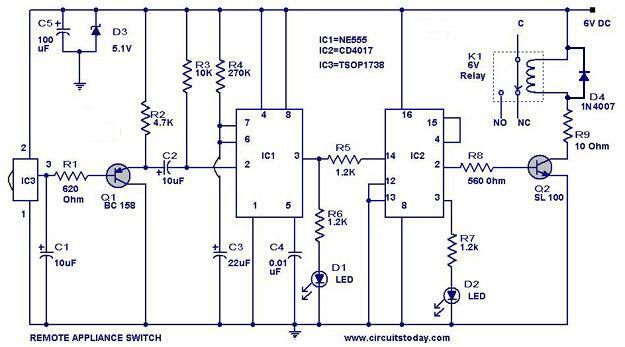 i want to connect this circuit to my fan and operate with remote is it possible are not if so how?? Amazing circuit…..a giant thanks to circuits today. My circuit worked on first attempt, i m so happy…thanks a lot…. I WANT TO GET ONLY 6V OUTPUT. I WANT TO SWITCH ON SOME DC DEVICES.I DONT WANT TO TO FIX THIS CIRCUIT TO APPLIANCES.CAN YOU TELL WHERE TO CONNECT DC DEVICES. HI Raghu! I understand your problem. It happens only when you turn on and off your circuit very fast. It happens because the capacitor contains some charge stored even you turn off and it takes sometime to discharge completely. So, if it is large delay when switching the circuit, the problem cannot be seen. this circuit is working fine but i have a small problem with this circuit..i have connected a ac motor as a load to the circuit and it is working perfectly ..but my problem is .. the circuit toggles state as soon as it is switched on .. i.e., if the motor is in running state when the power is switched off.. once the power resumes the motor will be in stop .. and vice versa.. i want the motor to be in off state irrespective of its state before it loses power…..
Hi Arifuddin Sheik a nice blog. Your circuit 2 is quite simple. you have explained about the above circuit also nicely. yes NE555 is added for positive fail safe switching. your idea of using delay with acapacitor without the use of NE555 is also good. keep it up. thanks for your comments. readers can visit his blog on the following address. useful informations. Hi Vinod Refer to Note and have you tried whether your remote control is respoding by checking for the out put of IC3 is going low. Check whether led D1 is flashing and D2 is changing from on to off with each press of the remote control. Check Q2 Connect a freewheeling diode (reverse biased) 1N400X series in parallel with relay coil of K1. With these checks you can solve the problem. circuit is completed,but there is a problem that load connected to the ckt is not showiing output…so please help me what to do…?? it is working guys. but you need little tweaking. becarefull with connections and transistor pins. I need a multichannel remote controller and switch driver circuit. anyone help me. plz reply , is it working 100% , anybody made this ? i need to know about the details of ic CD4017.how it is working as a flipflop? is it working correctly plzzz give me reply……. the ic2 mentioned here is the CD4017, this is a decoded counter, could you please explain how it can work as a flipflop? I had seen an error in your circuit it was no Zenner diode current limiting safty resistor.else Zenner can be damage by the high current.